Very pretty and neat design Gloria. 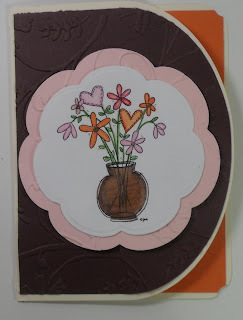 I’m so glad you joined our Orange & Pink challenge at Designed2Delight. Please come back again next week! This is so pretty Girlia! Awesome job on the coloring and I like the different shape of this card! What a great shaped card! Such a pretty card and design! Thanks for playing at Designed 2 Delight!